Anyone who has followed my blog for a while is aware of some of the challenges I face with certain ingredient combinations. To keep the peace, my husband has several food rules that I try to follow. “No fruit or dried fruit in a savory dish” is one of them. 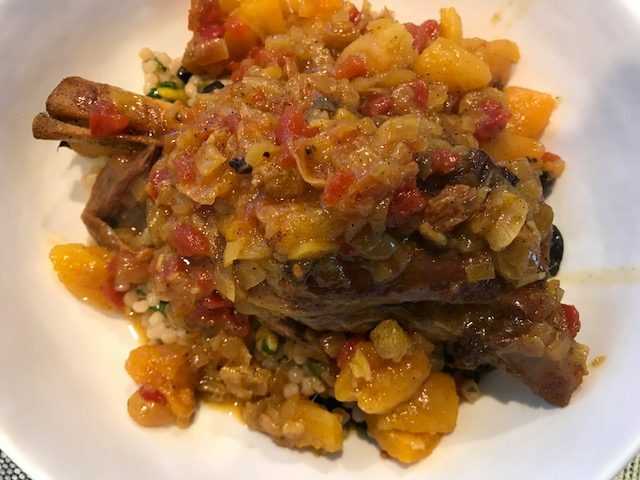 When I looked over this week’s recipe for Cook the Book Fridays, Lamb Shank Tagine, I couldn’t come up with a decent substitution for the apricots and raisins featured in the sauce. Then I remembered that Howard has eaten a lamb stew that my sister-in-law made, one that had dried apricots. He didn’t complain (which he would have), so I thought it was worth taking the chance. The tagine takes a long time to cook, but most of that time is hands off. The lamb needs to marinate overnight in a fragrant spice paste, so some advanced planning is necessary. First, the marinated lamb shanks are browned, then the aromatics (onions, and garlic and bay leaf) are cooked. A pinch of saffron adds color and flavor to the pot. Finally, some liquid for braising: water, diced tomatoes, and bit of honey. 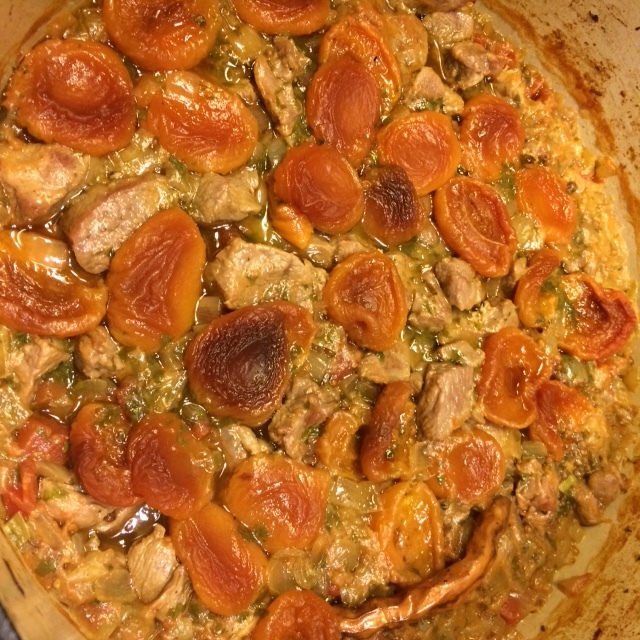 After an hour in the oven, the lamb is flipped over, and half of the dry fruit added to the pot. It cooks for another hour. Then the remaining dried fruit is added, and the uncovered pot continues to cook, allowing the sauce to thicken up. During the long cook time, I left the house a few times. On returning, the aroma was wonderful. When the tagine was ready, the lamb was tender and falling off the bone. 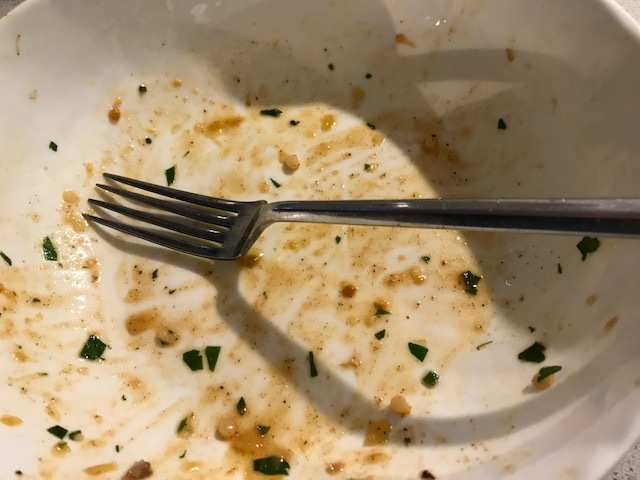 I served the tagine with the recommended Lemon-pistachio couscous. 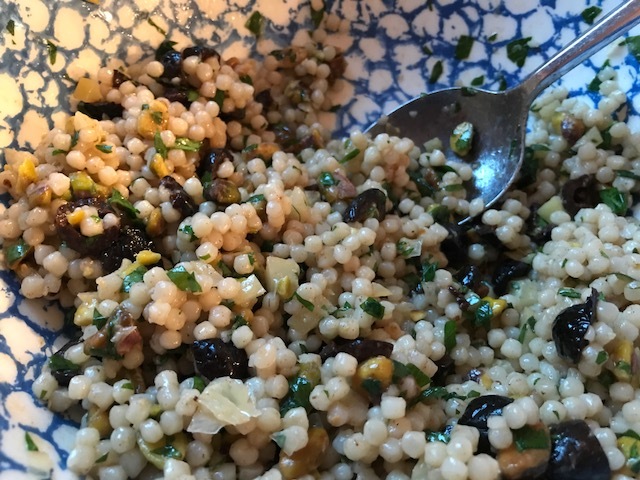 For the couscous, I used oil-cured olives instead of the dried fruit. This side dish comes together easily by stirring cooked Israeli couscous into an array of wonderfully flavorful Mediterranean ingredients: preserved lemon, pistachios, the previously mentioned olives, parsley, butter, and a touch of cinnamon. I didn’t properly account for my olive substitution, so it was a little on the salty side, but delicious nonetheless. As for the tagine, I loved the tender meat, but found the fruit and honey sweetened the sauce too much. The sauce didn’t thicken that much, and unfortunately (and surprisingly) the saffron flavor didn’t come through. I plan to tweak this one, keeping some of the fruit but looking at other recipes get ideas for more savory additions to the sauce. What did Howard think? His empty bowl says it all. You can find the tagine recipe on page 199 of David Lebovitz’s My Paris Kitchen. The couscous recipe is on page 237 of the same book. You can also see what my Cook the Book Fridays friends thought of this recipe by following their links here. 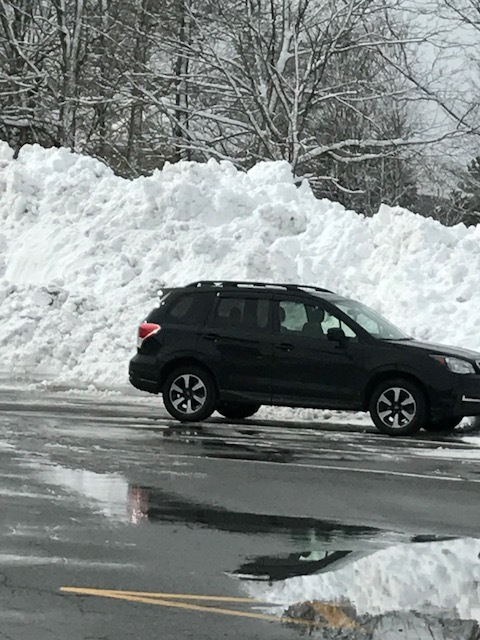 After the third Nor’easter in three weeks, here’s the snow pile in one of town’s parking lots. Impressive! It’s hard to believe that French Fridays with Dorie has less than two dozen recipes left to complete cooking all the way through Dorie Greenspan’s book Around My French Table. Some of the ones left are amongst the less appealing, but there are still a smattering of recipes that are tempting, as with this week’s Lamb and Dried Apricot Tagine. I’ve been a loyal participant, barely skipping any recipes. I do have a handful, about half a dozen, that I need to catch up on so that when we pass the finish line this spring, I will have a full sense of accomplishment about this project. Lamb tagine is the perfect thing to make when the weather outside is frightful, and you don’t want to leave the house. When your kitchen smells like distant sunny places, you just know that dinner will be warm and hearty which makes it easier to get through a gray and dismal afternoon. As with most stews, whether pedestrian or exotic, making tagine is simple, especially if you start with boneless meat. Alas, I can never find boneless lamb shoulder. Between the blades and joints, shoulders have many odd shaped bones and a ton of fat. So I just cranked up the podcast playlist on my phone and worked away with my knife. The perfect podcast was in my lineup: Dorie herself was being interviewed (along with Christine Muhlke, executive editor at Bon Appetit) on one of my new favorite shows, Radio Cherry Bombe with Julia Turshen from Heritage Radio. That’s a lot of onions! Once I’d transformed a pile of shoulder chops into a pile of boneless lamb chunks, the rest was smooth sailing. First, the lamb is browned. Then, the sauce gets started. 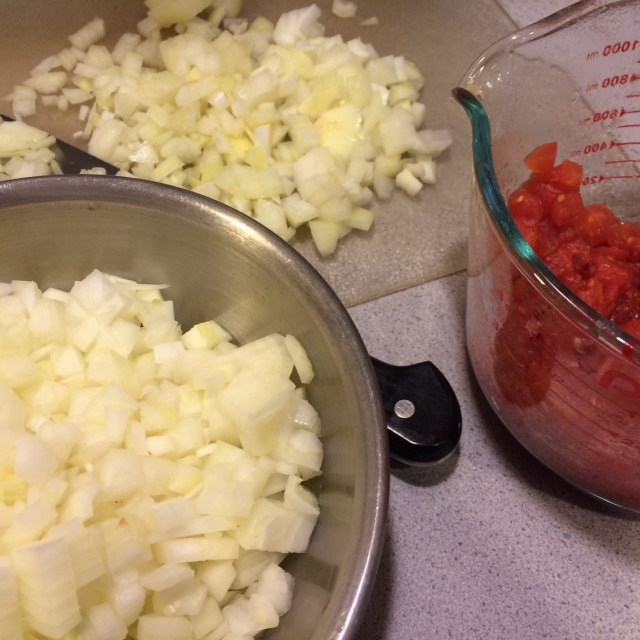 Chopped onions and garlic are softened, canned tomatoes are added, then some stock. Finally, an array of Moroccan spices are stirred into the pot: a chile pepper, cracked coriander seeds, grated fresh ginger, a couple pinches of saffron, cumin, cinnamon, and some chopped cilantro. 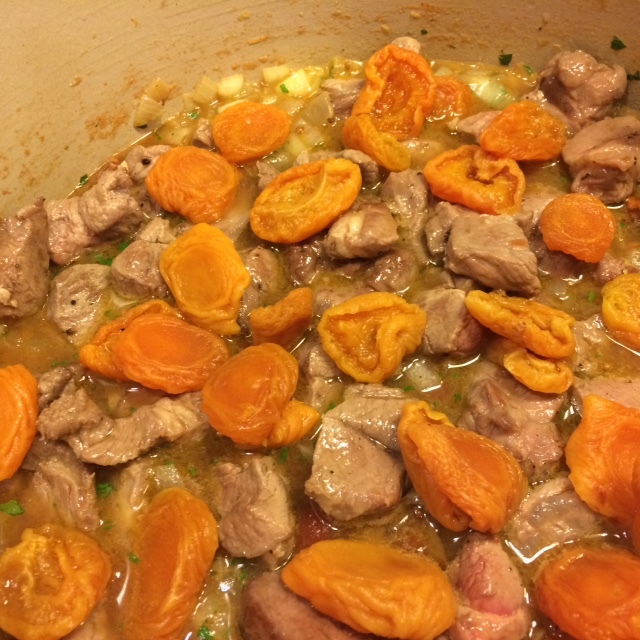 Browned lamb and dried apricots are layered on top of the sauce before sealing up the pot and popping it in the oven. Now the hardest part is waiting for the fragrant pot to simmer and do its magic while the aroma from the oven makes you dream of a shopping expedition in a faraway souk. And it is worth the wait. 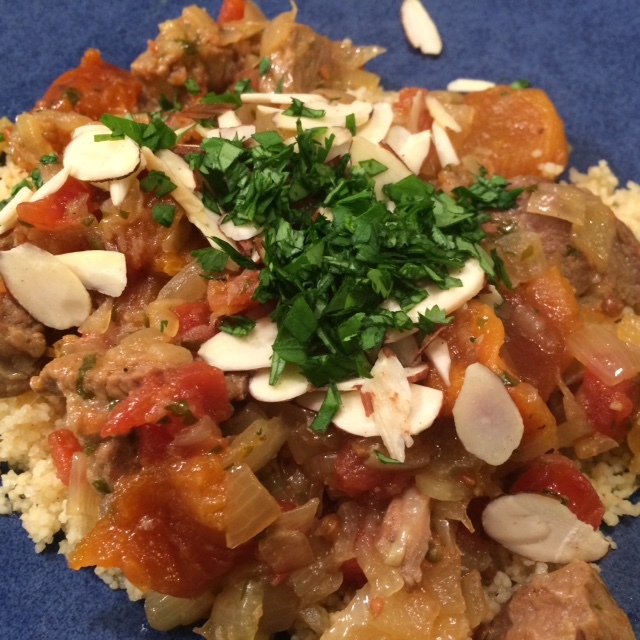 I served the tagine over couscous and sprinkled with more fresh cilantro and some toasted almonds. It was fantastic! I was able to continue my Moroccan fantasy over dinner. Of course, anyone who follows my blog might anticipate how this went over with Howard, the man who won’t eat fruit in savory dishes. I was hopeful because his sister makes a delicious lamb stew with prunes which he has previously eaten and enjoyed. However, at our house, he picked the fruit out and added them to my plate. When I asked him how it liked it, he said, “Well, if you’d used carrots, I’d give it 5 stars, but with apricots, it only gets a 3.” That’s promising and a good idea for a future riff on this dish. Next time, I’ll try substituting some thickly sliced carrots for half of the apricots, adding a similar burst of orange color and, because I’m eating all the apricots, keep the proportion of fruit I consume the same. If serving to company, I would just add carrots and use the original amount of apricots. To see what the other Doristas thought of the tagine, check out their links here. To make it yourself, the recipe can be found here or in the book. Thanks to everyone for your delightful birthday wishes. With each thoughtful message received from my friends and family, my day was made that much more special. I enjoyed a multi-day celebration, filled with good company and delicious food. I LOVE birthdays, mine or anyone else’s!